Well that’s it WPPI (Wedding and Portrait Photographers International) is over. As I write this I’m sitting in my hotel room at The Orleans waiting for my ride to the airport and thinking about all of the experiences I’ve had here in Vegas. I’ll start things off by saying that Vegas is a fun place but for me it gets old quick, I mean are people really buying timeshares from some guy giving out free beer coupons? They must be otherwise they wouldn’t do it but I can’t imagine doing business with these types of people. I do like to gamble but not very much, when I lose about 50 bucks I get tired of watching money vanish and give up. So why the heck did a Pet Photographer go to a wedding photography conference? This winter has been hard (tell me something I don’t know, right?) and it has really killed my motivation to get out and shoot, so I thought this would be a great opportunity to be around other photographers and learn more about this industry. The hope for me was to get inspired to get out and do something different and learn more about this industry. I think it was what I needed I’m already trying to work up ideas for future projects and I’m getting excited thinking about getting out of my comfort zone and pushing my creativity to a new level. Zack Arias getting a little love from some fans. The first class I went to was Zack Arias’ One light in about an hour. I’m a huge Zack Arias fan and his work and his attitude is a huge inspiration to me so this class was top on my list, in fact he was the biggest reason I wanted to come here. His class was great he brings such a positive energy and really helps people understand lighting. I really wanted to do his 2 day workshop but it started a couple days before I was going to be here so it didn’t work out. I do plan on attending his workshop in the future. At the end of his class he stuck around to talk to everyone who stayed and there was a lot of them, in fact at one point I left because I didn’t want to wait and I knew he was leaving for home that day so I didn’t want to bother him. But wait I flew all the way to Vegas to have new memorable experiences am I really going to leave without at least shaking his hand? No I turned around went back and waited. I didn’t know what I was going to say I didn’t want to come off as a fan boy (which I am and I’m ok with that). Needless to say I was nervous I don’t know why I was because as much information as he shares online I felt like I already knew him which is kind of a weird feeling. So after chatty Cathy got done talking to him I was up, I shook his hand and told him how much I enjoyed his work and how I was looking forward to Dedpxl. He was awesome we walked and talked and he acted like I was the first person to compliment him that day. Zack was the same person in real life as he is online and that was refreshing, the crazy schedule that the speakers have I’m sure he was just ready to run out of there. I didn’t take up much of his time but I really appreciated the time he gave me. Later that day I tweeted about meeting him and he remembered meeting me and said I should have told him my twitter handle so he knew who he was talking to. Really I thought? I’ve tweeted him and commented on some of his stuff and he remembers that…cool. The next day I seen he started following me and I was blown away I couldn’t wait to tell my wife, I know what a dork. Another class I went to was called #marketingswagger taught by JP Elario who is a wedding photographer in New York. Not only is he a great photographer he is also a great marketer and speaker. I had never heard of him before but I liked the title of the class and I wanted to make sure that I hit some of the marketing/business classes while I was here. JP was cool I mean he had great energy and you could tell he was in his comfort zone. He covered a lot of the social media aspect and I can say that I picked up some good pieces of information. His dad Joe (I think) is also a photographer and he has been in the wedding business for 35 years. Joe was also a cool guy and had his own swagger, it was easy to see where JP gets it from. You can tell Joe is all photographer he was shooting during the presentation and one of the things he said was that a photographer should always have his camera out and ready to shoot, not with a lens cap on, that is the sign of an amateur he said. He’s right not that I am very good at following that. JP gave us some great information about getting more Facebook interaction and making a real impact with social media, and I am looking forward to using that information and keeping up with what JP is up to. Another experience I had was shooting a model at the Sigma booth. All the lights were set and a beautiful model waiting to be photographed I mean what more could a photographer ask for. I was pretty nervous about doing it and I think it was just because there were so many other photographers standing around and I’ve never shot a model before let alone with a bunch of people standing around watching me. 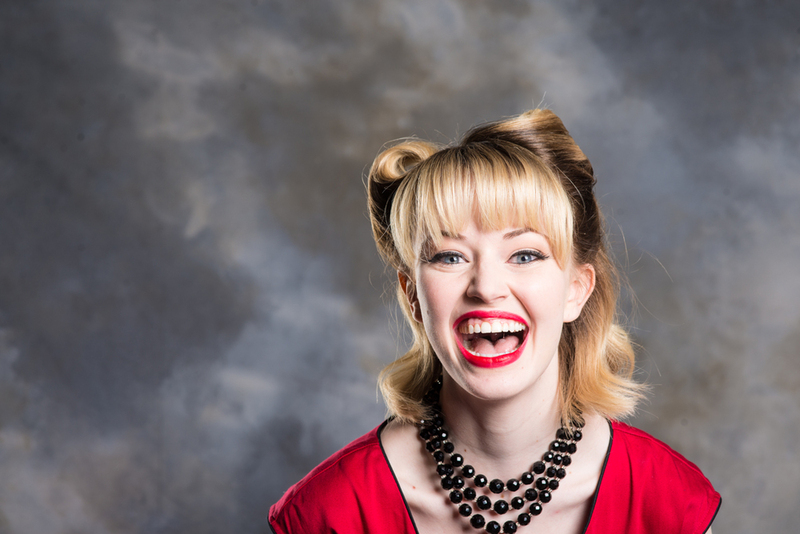 The model was great and she went through a few poses and I think I fired off about 15 shots. There were 2 models working in the booth and they were standing and posing all day long, I thought it seemed like they had one of the harder jobs at the convention. The highlight at the Sigma booth was meeting Lindsay Adler I enjoy her work and am currently reading her book Creative 52. I think what impresses me the most about Lindsay is the fact that she is pretty young and has accomplished so much and will continue to do great work and grow. She has started a new business called Dreamshoot Rentals and they rent out beautiful dresses and head pieces to other photographers for their own photos shoots. I’ve seen some of the pieces and even I get excited thinking about how I could use her new service. 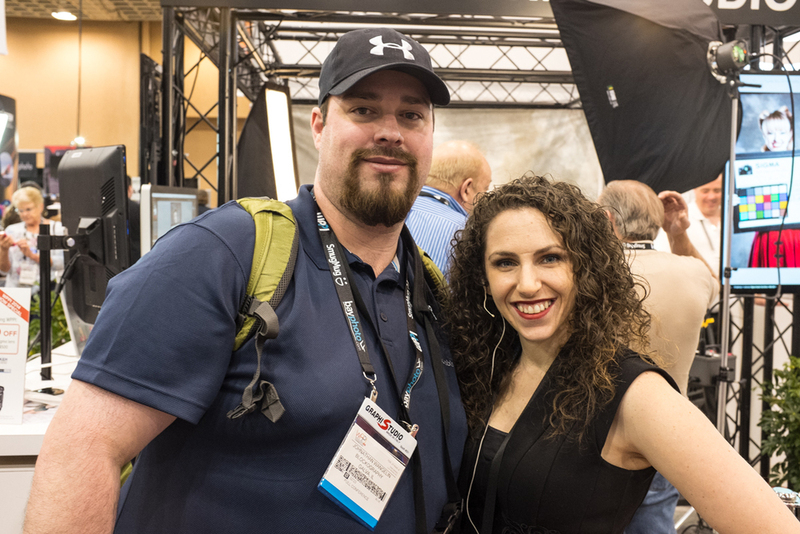 Me with Lindsay Adler at the Sigma booth. I also attended Lindsay Adler’s class on posing. The class was focused on properly posing people with features they would like to conceal or at least not make to obvious. It was a good class and I felt like I got a lot out of it and am ready to get out and try out some of the techniques. Lindsay is a great teacher and I look forward to watching more of the content she produces and seeing where she is headed next. A few of the instructors were headed to Gulf Photo Plus in Dubi after they left Vegas and as much fun as that sounds it also sounds effing exhausting. Zack Arias was another who was headed to Dubi and I think he said he was home for a day before he took his 14 hour flight to Dubi. Ugggh 14 hours! I’m sitting in McCarren airport right now dreading the 3.5 hour flight I’m about to have so 14 hours just sounds like the worst thing ever. So would I do WPPI again? The short answer is yes. Do you want the long answer? Well if you keep reading that’s what your going to get. I’m typing this as I wait to board the plane in about 2 hours so I got some time to kill. Yes I would go back but I would do something’s differently. First my god first because it was the biggest mistake I made, Stay at the MGM where they are holding the conference. I tried to save a couple of bucks and stay off the strip at a place called the Orleans. The Orleans was nice enough for the money, the rooms were clean the staff was fine so I have no complaints about the hotel itself but I thought I would be able to take their shuttle to the strip but it didn’t start running until 9 a.m and only went to one location on the strip. So I had to take a taxi to the MGM everyday. I think it was about $120.00 or so just in cab rides, so add that on to what I spent for the room and the price difference starts to narrow. I only wanted to use the cab twice a day so I was at the convention all day and didn’t get a chance to go back to my room and take a break like I would have liked. Also some of the events started later in the evening so I missed out on those because I didn’t want to hang for a couple extra hours and didn’t want to pay to go back again. There was some downtime between classes so it would have been nice to head back to my room and relax for a little bit. Second thing I learned was to plan plan plan. I did plan out some of my classes but not all of them it’s a good idea to do a little research on the instructors too that way you have an idea what they will be talking about and if you like their style or not. It’s cool to go into a class and knowing a little bit about the instructor. If I go again I think I would go to one of the 2 day workshops and do some of the Master classes, so that more of my time would be filled with instruction and I wouldn't have to kill as much time at the trade show. The trade show is great but there are some great people there teaching classes and sharing their experiences and thats way more valuable to me than looking at the latest greatest gear. Plus there would still be time to go through the trade show to see the new stuff and some of that stuff is pretty cool. The third thing kind of falls under planning, go with another photographer or many other photographers. I went by myself and that was fine but I’m not great at meeting new people so my interaction with other attendees was limited and I think if I would have been with a group of people the opportunity to meet others would have been better. I did meet a few people but I really wish I was better with that type of thing it’s one of many things I need to work on. Consider renting a car or finding a way outside of town to do a photo shoot, there is some beautiful landscape that would be great for photographing you and your friends in a little photo shoot. One of the best pieces of advice I read on many blogs was to bring something to eat and drink. I brought some snack bars and refilled my water bottle while I was walking around. There's so much to do you don't always want to stop and grab a bite plus this way you save a couple bucks I think I paid almost 4 dollars for a can of coke. WTF? 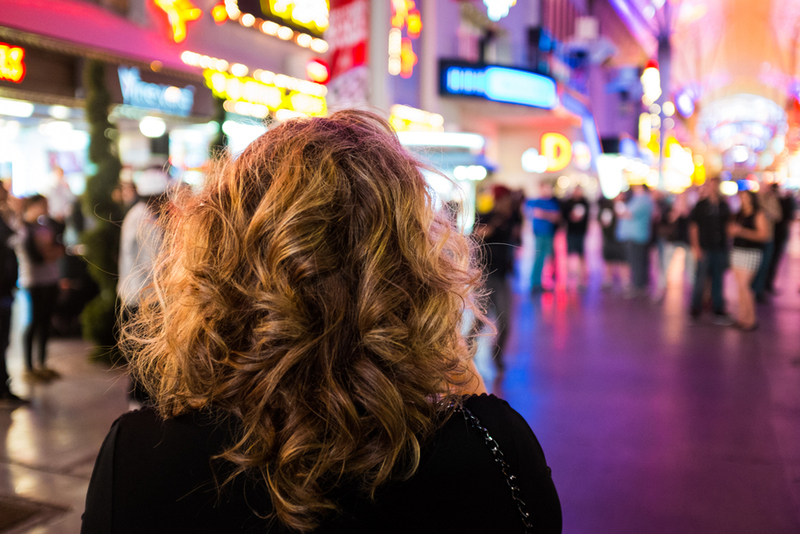 One adventure I took was going down to Freemont street to do a little street photography. Freemont is a pretty lively place in the old part of Vegas and they have been working on cleaning it up and attracting more people to that area. When my wife and I went down there for our wedding 8 years ago it was a little run down and not very busy but when I was there it looks like they’ve done a lot of work to it and people were responding well to it. Freemont has a different look and feel to it. They had some stage shows going with acrobats performing and I thought that was pretty cool. There was also street performers there playing bucket drums and dancing but of course there was a lot more homeless down there. First thought as a photographer is to photograph them because as bad of a situation that they may be in it makes for interesting photos. I did not go that route one because it’s disrespectful plus I would have had to get a little to close to them using my Fuji. There’s another tip I was so happy I didn’t bring my Dslr on this trip. It’s big and heavy and very noticeable. The last thing I want to do is look like a photographer when walking the streets so my Fujifilm X100s works great for walking around with. Shot from my bus ride to Freemont Street. I did make it out on the strip for part of the day. The strip is kinda meh to me I could take it or leave it. 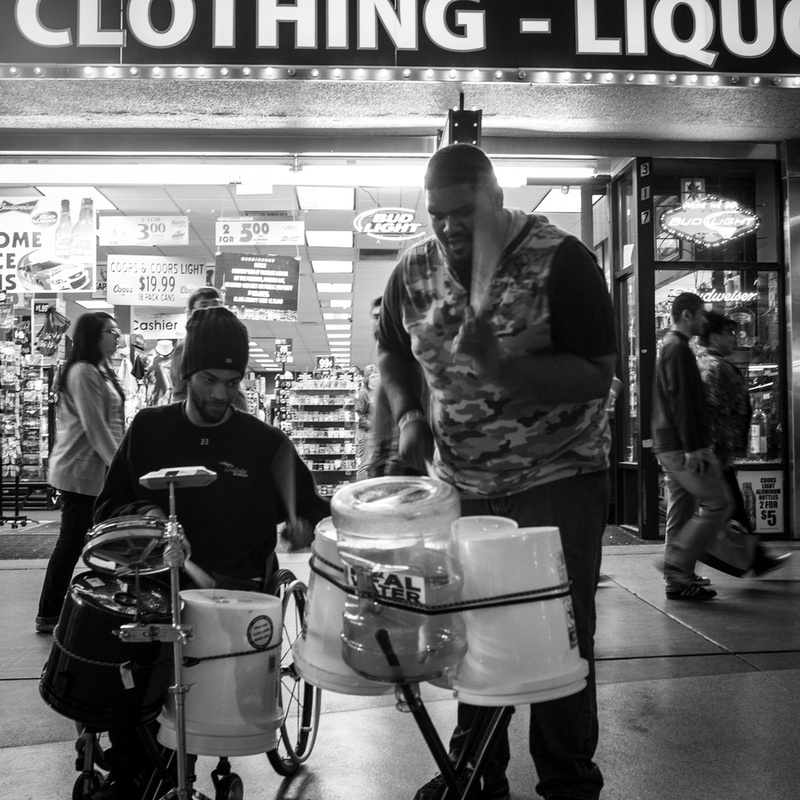 Here is a couple photos I shot while on the strip. Guy drinking coffee while riding the escalator. 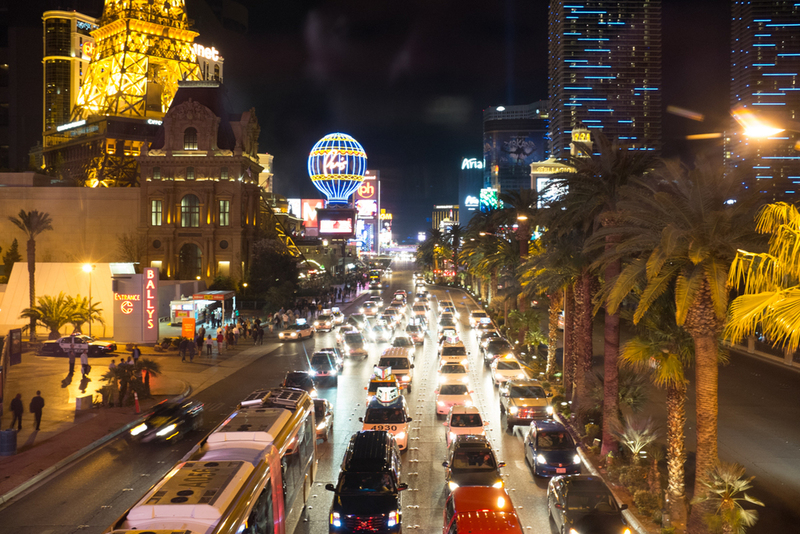 Panorama shot on the strip.